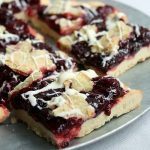 These razzleberry shortbread bars are an easy way to turn pie into a cookie! Line a 15x10 jelly roll pan with parchment paper. In your mixer combine shortening and sugar. Add flour, eggs, vanilla extract, and salt and mix until thoroughly combined. Remove the top of the pies and set to the side. Scoop out filling from pies and spread over the shortbread. Break up the top pie crust and press it into the filling.